GSI Outdoors Bugaboo is the dependable, non-stick option for all your outdoor cooking needs. These high-quality aluminum pots and pans are light enough for backpacking, yet heat evenly enough to satisfy the most demanding camp cook. GSI Outdoors Bugaboo is the dependable, non-stick option for all your outdoor cooking needs. These high-quality aluminum pots and pans are light enough for backpacking, yet heat evenly enough to satisfy the most demanding camp cook. On the outside, the durable, high temperature paint on Bugaboo series cookware protects the aluminum core from both abrasion and oxidation and provides a beautiful, gloss finish. Plus, each piece is fully-formed then coated with two layers of Teflon Classic nonstick coating for added scratch resistance. 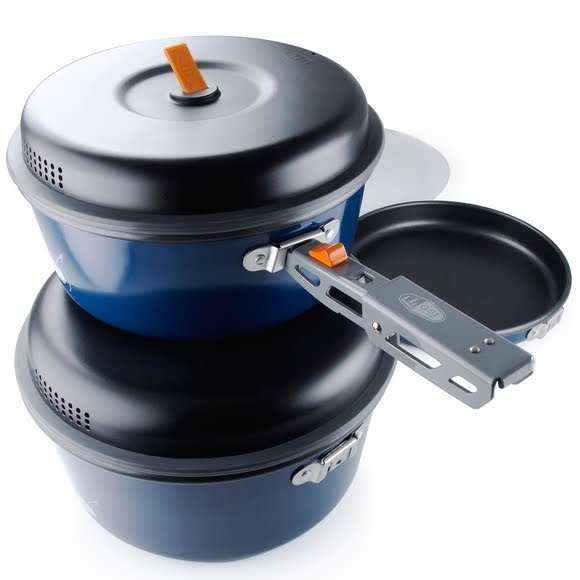 Exclusive folding gripper locks on to exterior brackets on pot and frypan to prevent scratching and to provide a secure handle while cooking. Unique design compacts for nested storage. Crushproof, heat-resistant strainer lid and silicone ring will not deform in packs and works with either the pot or the frypan. Sturdy, included cutting board has both dished and flat sides for a variety of prep duties and isolates the pots to protect the non-stick surface and prevent clattering. Dimensions (packed) 9.10" x 9.10" x 5.40"
Weight 2 lbs. 10 oz.